HARRISBURG – Allowing hospitals to spend more time helping patients, and less time adhering to redundant licensing requirements, Gov. 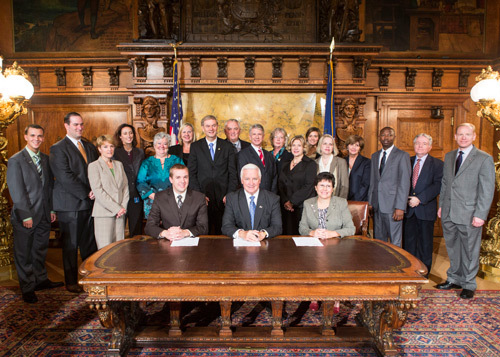 Tom Corbett ceremonially signed Act 60 of 2013 this week in Harrisburg. The bill authored by Reps. Bryan Cutler (R-Peach Bottom) and Pamela A. Delissio (D-Montgomery/Philadelphia) cuts costs for both hospitals and the state by ending duplicative licensing inspections. “This legislation streamlines the licensing process for hospitals by reducing redundant inspections, saving time and money, and allowing hospital staff to focus on patient care,” Cutler said. The law allows the Pennsylvania Department of Health (DOH) to use “deemed status” to exempt hospitals from state licensure renewal surveys. Hospitals achieve the status by earning accreditation from national organizations. Thanks to the law, if a hospital meets national accreditation standards and practices, they do not have to repeat the process at the state level. This saves the hospitals time and money from repeating themselves, and saves DOH time and money for not having to repeat the steps taken by national organizations. Patient care and safety are top priorities for Cutler, who is a former X-Ray technologist and manager of support services for Lancaster General Hospital. The law is good news for every hospital in Lancaster County, all of which already have national level accreditations and licenses, and will not have to repeat the process for the state any more. Rep. Bryan Cutler and Rep. Pamela Delissio who co-authored House Bill 1190, eliminating redundant hospital accreditation procedures, are joined by staff from Pennsylvania hospitals, as Gov. Tom Corbett ceremonially signs the bill into law. Hospitals that meet national licensing requirements will no longer have to repeat the process for state-level accreditation, saving hospitals time and money.